Dr. Aviv guides readers through healthy dietary choices with targeted recipes, helping them balance their bodies and minds for optimal health and break acid-generating habits for good. Do you suffer from abdominal bloating; a chronic, nagging cough or sore throat; postnasal drip; a feeling of a lump in the back of your throat; allergies; or shortness of breath? If so, odds are that you are experiencing acid reflux without recognizing its silent symptoms, which can lead to serious long-term health problems, including esophageal cancer. 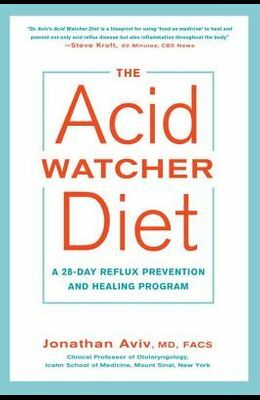 In The Acid Watcher Diet , Dr. Jonathan Aviv, a leading authority on the diagnosis and treatment of acid reflux disease, helps readers identify those often misunderstood symptoms while providing a proven solution for reducing whole-body acid damage quickly and easily. His 28-day program is part of a two-phase eating plan, with a healthy balance of both macronutrients (proteins, carbs, and fats) and micronutrients (vitamins, minerals, antioxidants), that works to immediately neutralize acid and relieve the inflammation at the root of acid reflux.